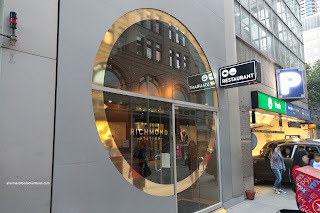 Of all the places we were planning to eat at while in TO, there was one high on the list - Richmond Station. Co-owned by Top Chef winner Carl Heinrich, the place has great reviews and personal recommendations from friends. The actual deal-breaker was not actually on the aforementioned reason. Rather, it was that there were things on the menu our kids were interested in eating. Yes, when traveling with kiddies, tasting menus and the such are not very practical. "Dad! I don't want to eat this foie gras...". We were able to secure a reservation and enjoyed a private car ride courtesy of our stay at the Park Hyatt all the way to the restaurant (so that is how the rich live...). 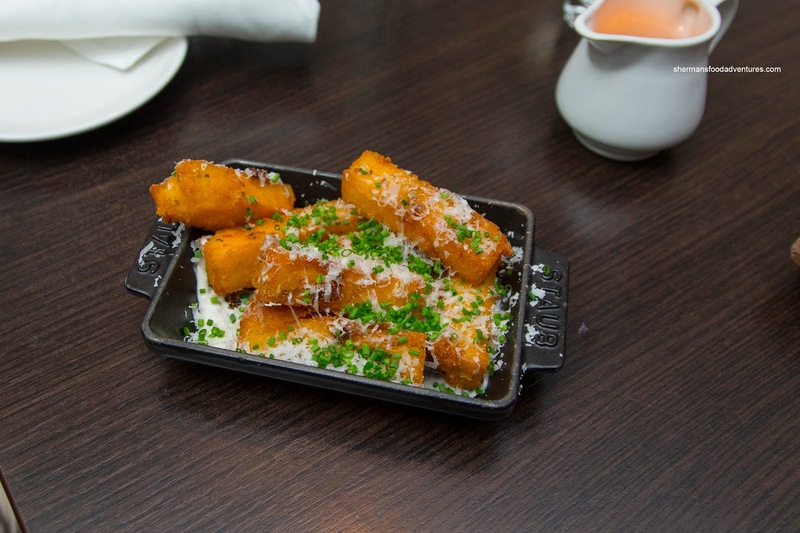 To begin our meal, we went for one the kiddies would love in the Crispy Polenta Fries. These were a hit since the contrast in textures was on point. Super crunchy on the outside while soft and pillowy on the inside, these were well-seasoned and cheesy. The truffled aioli was not super pungent which was good as it didn't overwhelm. 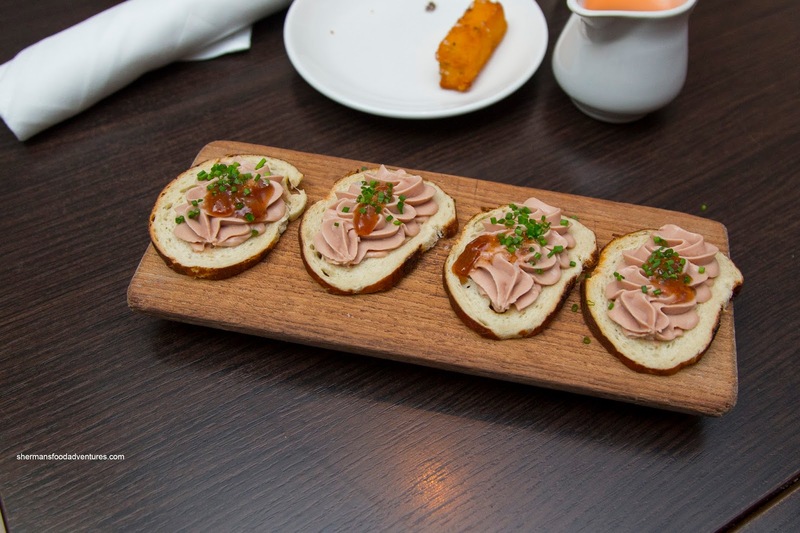 For the adults, we shared the Duck Liver Pate served on pretzel toast with apricot chutney and maldon. Smooth, airy and creamy, the pate was well-seasoned with a balanced amount of duckiness, sweetness and cognac. The maldon helped round out the flavours as well as the sweet chutney. The only thing I would've liked to see was a crispier toast. 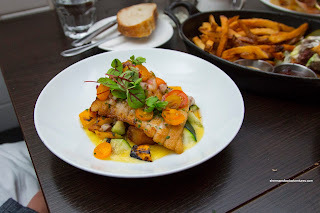 For my main, I had the Pan-Seared Skate Wing which was prepared as well as one could hope for. It was buttery and soft while sporting a crispy exterior. It was also properly seasoned while complimented beautifully by the tart and creamy Hollandaise. Underneath, the aggressively crispy potatoes held up to the moisture while the squash rode the line between soft and firm. Completing the plate was a salsa featuring red onion which was just pungent enough without being too sharp. 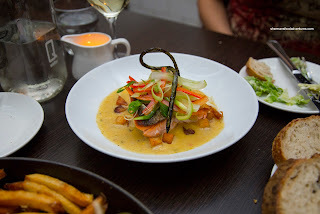 Viv also had fish in the featured dish being the Roasted Wild Spring Salmon. This was also expertly prepared with crispy skin while flaky and moist. It sat on a bed of sweet corn and bacon chowder graced with smaller pieces of crunchy potato. For me, I love the pop of fresh corn and the saltiness of the bacon. I would've liked to see the chowder even richer (but that is just me). The crunch from the potatoes was a nice textural contrast to the rest of the dish. On top, there was a celery salad and garlic scape. For my son, it was all about the Stn. 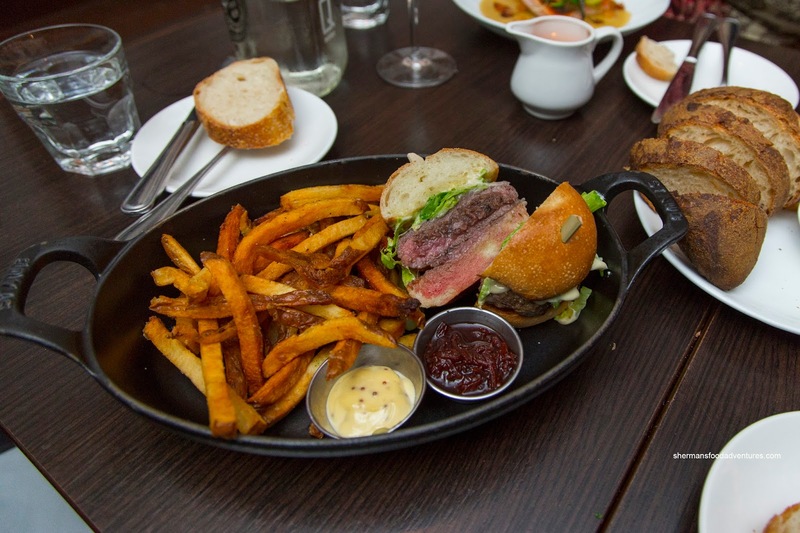 Burger with lettuce, beet chutney and aged cheddar on a milk bun accompanied by rosemary fries and dill pickle. Since they grind their meat to order, we were able to get it medium-rare (yes my kids were taught to not eat anything well-done). The result was an extremely juicy and meaty-tasting burger. We thought the soft milk bun was the right texture to stand up to the moisture while not being too dense. The sweetness of the beet chutney worked well with the pickled onions in our opinion. 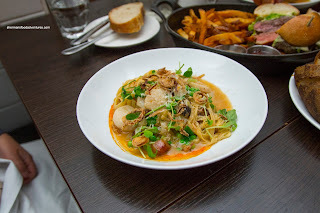 My daughter ended up with the Scallop Capellini with red pepper rouille, fennel, bacon, parmigiano, cherry tomato and pea shoot salad. Loved this pasta as it was fresh and sauced just enough with a tangy creaminess accented by salty fatty bacon and the crunch from the fennel. The cherry tomato provided pops of tartness and the large amount of buttery scallops made this a fulfilling dish. As you can ascertain, we enjoyed out meal at Richmond Station which was reasonably-priced to boot.